My last video done for Help Catalonia has been a hit!! It has turned into a viral video and thousands of people have seen it. We published it yesterday afternoon and became a big success. Several catalan famous people have retwitted it and in Rac1 (one of the most important radios in Catalonia) have mentioned it. Even Political parties and a lot of institutions have mentioned it! 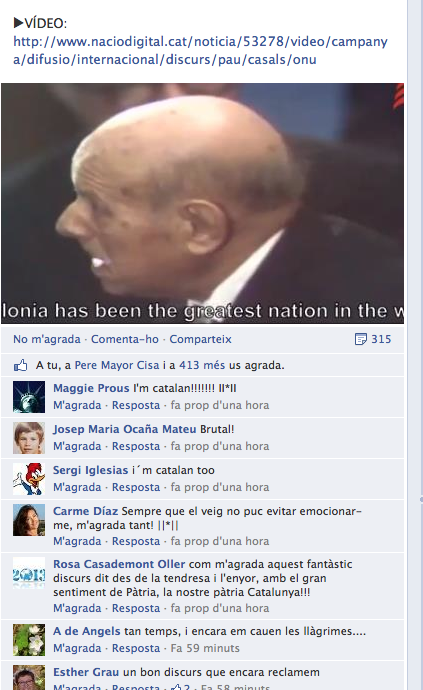 'What is more, I am a Catalan': http://t.co/kxV1MfZSgS via @diariARA Bona iniciativa de @HelpCatalonia. Posted on April 2, 2013, in Creative Futures. Bookmark the permalink. Leave a comment.